Selectamark actively seeks to obtain standards to demonstrate its commitment to delivering security solutions of the highest quality. The commitment is significant in both management time and money but we believe that everyone wins as a result. We, as a company, have better internal controls and you, as our customer, benefit from the peace of mind that we are customer focused and continue to deliver quality products. In fact, all Police, Local Authorities, NHS departments and Universities are required to ask for these standards. ISO 9001 – which specifies requirements for a Quality Management System. ISO/IEC 27001 – which provides requirements for an Information Security Management System. ISO 14001 – which sets out the criteria for an Environmental Management System. These standards give our customers the confidence that we are producing goods and services to the highest standard, keeping information assets secure, and ensuring that our environmental impact is being measured and improved. Secured by Design is the UK Police flagship initiative supporting the principles of designing out crime. It is supported and managed by the National Police Chiefs' Council (NPCC) and has the backing of the Home Office. It has been drawn up in consultation with the Department for Transport, Local Government & Regions (formerly DETR) as well as trade, industry and standards organizations. 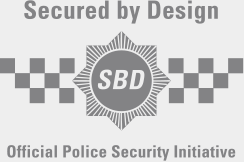 Secured by Design (SBD) is the corporate title for a family of national police projects involving the design for new homes, refurbished homes, commercial premises, car parks and other police crime prevention projects. Secured by Design licensed company status is awarded to those companies producing security products which pass standards and tests nominated by the police service as "Police Preferred Specification". Companies appearing on the product categories hold the Secured by Design Licence and produce one or more products, which meet technical standards endorsed by NPCC. The PAS (Publicly Available Specification) 820:2012 was developed by the security industry and BSI as a way of helping purchasers assess the length of time a forensic code continues to be identifiable when exposed to weathering. An independent laboratory awarded SelectaDNA the highest grade in the industry - grade A external - proving that our synthetic DNA codes can survive outdoors for at least 5 years. 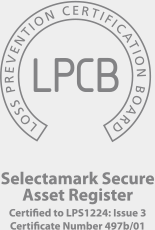 The standard issued by The Loss Prevention Certification Board which specifies requirements for Asset Registration companies providing third party secure asset registration services within the UK such that the information they are responsible for registering and maintaining is both secure, and can be used to verify the identity of the registered keeper of an asset registered on the secure asset register. The latest version of the standard – Issue 3 – covers the use of an online database for customer registration and account management, and for Police searching 24/7. We are the only company in the UK to have invested in an online database that is accredited to LPS1224: Issue3. Thatcham Research is the motor insurers’ automotive research centre. Established by the motor insurance industry in 1969, the centre’s main aim is to contain or reduce the cost of motor insurance claims whilst maintaining safety and security standards.